Philadelphia has been installing bike lanes for over a decade. They’re a big draw for its young residents. You can’t drive through any major U.S. city now without spotting a bike lane. Separate spaces for bikes have surged in popularity, prompting cities across the country to widen their roads, and in some cases reduce car lanes, to accommodate for cyclists. Bike lanes are typically five feet wide. They run adjacent to car lanes, generally traveling in the same direction as cars. They can next to the car lanes, separated by either by a parking lane or other barriers, and are most often in addition to sidewalks. Based on data from seven major U.S. cities, the number of bike lane miles has increased about 50 percent from between 2006 and 2013, and cycling has increased about 100 percent, according to the National Association of Transportation Officials (NACTO). Bike lanes also decrease risk for bicyclists. The same NACTO survey showed that an increase in bike lanes was correlated with a decrease in risk, which diminished by about 50 percent between 2006 and 2013. Between 2000 and 2012, the number of commuters who rode their bicycles to work rose by 60 percent, according to the U.S. Census Bureau. 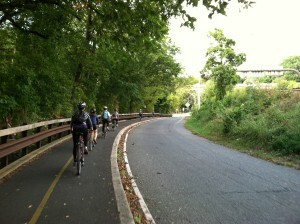 The number of bicycle commuters rose from about 488,000 in 2000 to about 786,000 in 2012. 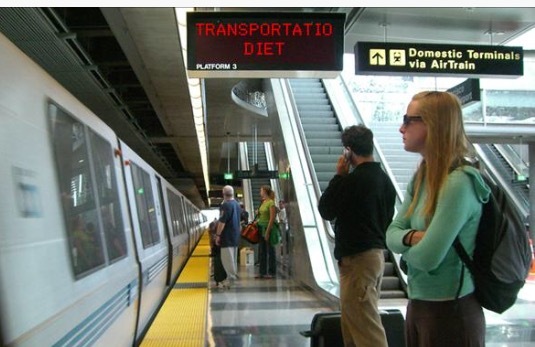 This week, Curbing Cars inaugurates a new feature called My Transportation Diet. We’re asking our audience to tell us how they get around where they live and work. First up is Michael Leland, who is the News Director of Iowa Public Radio. He lives in Des Moines. “My transportation habits are a little of several things. I live about a half-mile from my office in Des Moines, so it takes me about 10 minutes to walk to work. I’ve mostly walked to work for the last two jobs I’ve had over the last 10 years. I drive if I need to do something after work, like grocery shop. I live a couple of blocks from a commercial district, so a coffee shop, my bank, and several restaurants and bars are all within a 15 minute walk from my home. I live close enough to downtown (20-25 minutes) to walk to things like the library, barber, farmer’s market, church, etc., though sometimes I take a free circulator bus into downtown from the office, and then walk home. I mostly use my car for errands like grocery shopping and other weekend needs. Sadly, the downtown area in Des Moines doesn’t have stores like Target, PetsMart, and other major retailers, so I need my car for those. We’d love to feature you in My Transportation Diet. Send us your story at curbingcars@gmail.com. We’d welcome your photos and video, too. I’ll bet you’ve notice more people commuting to work by bicycle over the past few years. I just moved away from one of America’s best cities for bicycle commutes — Ann Arbor, Mich. — but I now live next to another one of the best, Tempe, Ariz. They’ve both college towns and that seems to be an attribute of many of the nation’s leading bicycling cities. 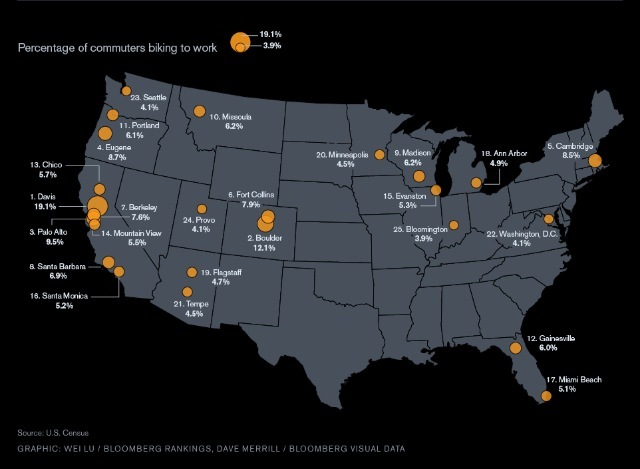 Take a look at this wonderful Bloomberg graphic on the top places where people get to work on two wheels. Is your town on it? What will it take to land your town on it? From Tucson to Kansas City, Denver to Detroit, it’s been a busy summer for transportation news. Tucson’s new light-rail system, the Sun Link. The Denver-based study showing that more bikes can actually be good for city safety. The challenge posed to cities by parking craters. Take a listen, and share it with your friends. Would you like to hear more episodes of the Curbing Cars Podcast? Take our survey. Mobile Bike App Encourages Biking Across The U.S.
Getting into the spirit of biking might be as easy as turning on your smartphone. An organization called My City Bikes has now launched 14 different smartphone apps all aimed at providing a simple and user-friendly tool for bicyclists. Sara Villalobos with My City Bikes said the goal of the project is to make bicycling accessible to everyone in each city they create an app for. Villalobos said they partnered with local bike shops in each city to create a comprehensive application for users that provides information such as routes, local repair shops and beginner bike tips. In places such as Phoenix, where hot and arid climates present health risks to riders, Villalobos said a useful tool in the application is a heat monitor to help people keep track of how much water they should be drinking based on the current temperature and how much they’re exercising. The app is available for free on Android and Apple smartphones. Comments Off on Mobile Bike App Encourages Biking Across The U.S.
Who says only motorists can show up in style? Valets are no longer only for cars. They are becoming an increasingly popular method of accommodating bicyclists at large events. Here are just a few of the places where cyclists can show up and check their bikes. St. Louis has taken the luxury, convenience and style of car valets and offered the service for bicyclists heading to the state fair over Independence Day weekend. The St. Louis Post-Dispatch writes the service is like a coat check for cycles: “A fairgoer can hand over his or her bike to a valet, get a claim ticket and the valet will watch the bike until the owner picks it up.” Its all part of a plan to encourage alternative transportation and while it might not seem like an essential commodity, bike valets certainly beat the $30 cost of parking at the event. In Oregon, the Center for Appropriate Transportation provides bike valet service for various events. The system uses volunteers to park bikes and set up the parking area. 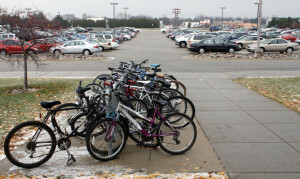 At large events where parking prices can be at a premium, organizations such as the Center for Appropriate Transportation costs only between $140-$450 a day to run its bike valet service at events. Beside the convenience of having a valet, the constantly monitored parking also provides an added level of security for bicyclists who might be concerned about leaving their bike somewhere. Portland is also home to the largest daily bike valet service in the United States. It is free and runs five days a week for commuters. Besides adding security and convenience, Go By Park provides bike repairs that can be performed while commuters are away. As biking continues to grow in popularity, a new report is adding to the list of reasons why cities should step up their efforts to accommodate cyclists. Researchers at the University of Colorado Denver found that as more bikes hit the streets the number of collisions goes down. The study focused on Boulder, Colo., because of its high biking population and because the city has been performing bike counts for more than a decade. Wesley Marshall, an assistant professor of civil engineer at CU Denver, told Curbing Cars that once intersections began seeing upwards of 200 bicyclists a day, the number of collisions began to drop. It may seem counter intuitive that as an intersection has more moving parts, the number of incidents would go down. While the CU Denver study did not look into the reasons why incidents were reduced, Marshall provided some possible explanations. As you can see above, getting a bike ready for airline travel can be an arduous task. Admittedly, bike-touring might not be a large cross section of the population and even David French, who is a regular bike-tourist, agreed in a recent Elliott.org article. But since the late 1970s, when French brought his his bike along on trips to Europe, he says it has become increasingly difficult and costly for people to travel with their bikes. 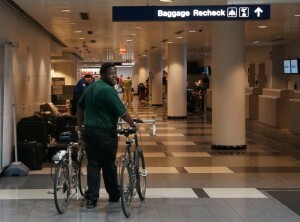 Fees have increased enormously for someone bringing a bike on a plane. 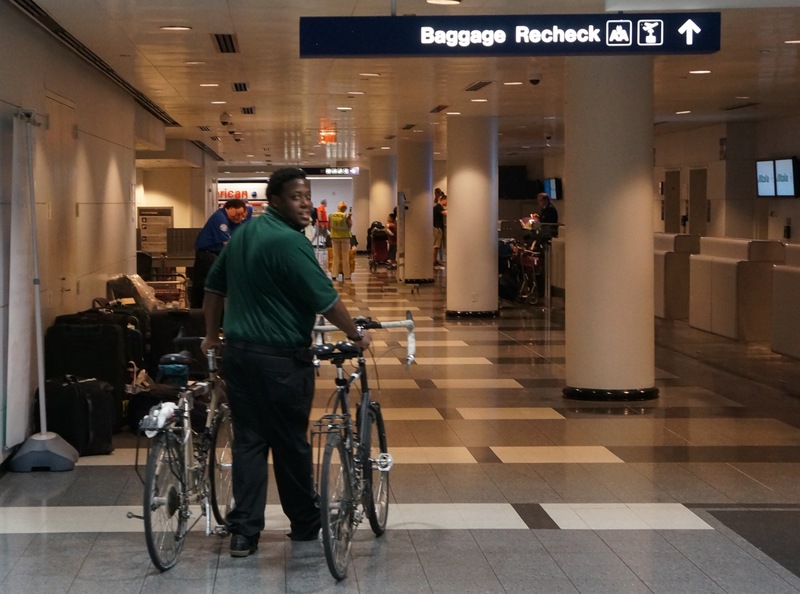 As Christopher Elliott writes, someone looking to bike-tour should expect to spend between $100 and $300 to check their bike as luggage.